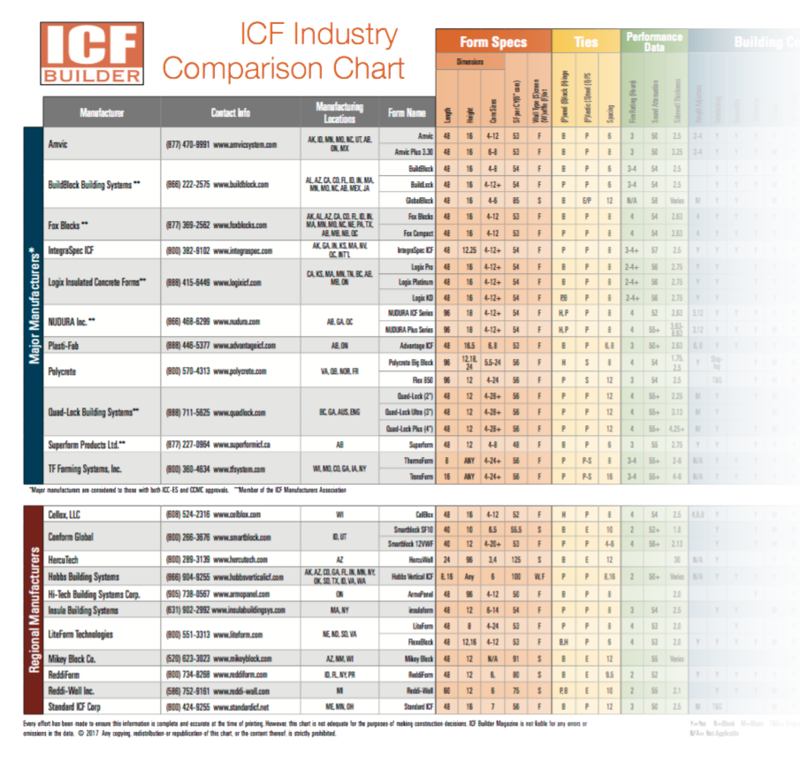 ICF Decking has been gaining popularity and you’ll find all the latest data here! Earth friendly ICF block manufacturers. Flat wall ICFs measuring 48″ x 16″ have become industry standard. However, some are 12″ or 18″ high, and a few are installed as vertical planks. Careful readers will notice a few waffle- and screen-grid systems still on the market, which use far less concrete, but require more engineering. Actual core widths vary widely; a six-inch nominal wall may vary from 5.5 to 6.75 inches, which accounts for the variability in the “Sq. Ft. per Cubic Yard of Concrete” column. The thickness of the foam sidewalls, which affects form strength, insulation value, and amount of raw material used, also varies. Freight is a significant factor in pricing, which is why the chart notes the location of molding facilities. Panel systems (knockdown forms) reduce shipping, but require more labor as jobsite assembly. Reversible interlocks and specialty forms can make installation go faster and reduce waste. Even more important than cost is the installer’s experience and familiarity with the forming system. For do-it-yourselfers, manufacturer support is critical. Work with a distributors that will answer questions, rent bracing and other equipment, and provide immediate assistance if you come up short on anything. In summary, these charts are a good place to start in selecting the best form for your project, but additional research will be needed. Visit the manufacturers’ websites and sit down with the local distributor. Ask to tour a jobsite and get references from other customers. Over the last decade, EPS decking products have become increasingly popular. They’re used for roofs and floors, even tilt-up walls and sloped roofs. The table below contains technical data for all the EPS flooring systems. Major differences between brands include whether they’re custom-cut or modular, the amount of shoring requirements, and how the utility chases and interior finishes are applied. Made from a blend of EPS and Portland cement, these blocks are termite-proof, fireproof, and will not melt or burn. All are screen-grid blocks, meaning the concrete forms a series of columns and beams (usually every 16 inches on center). Because of the extra foam, they offer higher R-Values than their all-foam counterparts, and use about half as much the concrete. They’re considerably denser—and heavier—than regular ICFs; a 48”x16” block weighs nearly 50 lbs. and larger ones need to be craned into place. This typically means higher shipping costs in locations outside the southwestern U.S. The blocks are extremely robust, and stand up well to high-slump mixes and extra vibration. They need less bracing, and nails and screws hold wherever they are driven, making interior and exterior finishes easy to apply. Stuccos and plasters can be applied directly to the block without mesh and without sheetrock and still meet code. The forms can be shaped with standard carpenter tools. Made from wood fiber and cement, these blocks mimic concrete masonry units in size, weight, and shape. Unlike CMU, though, they do have some insulating value, and finishes attach directly to the block without furring. These are best suited for projects where the form will double as a final finish, such as fish farms, car washes, and wastewater tanks. Vinyl is a poor insulator, but EPS inserts can be added to one side of the cavity if needed.